Hello and welcome back to our blog after a bit of a break! 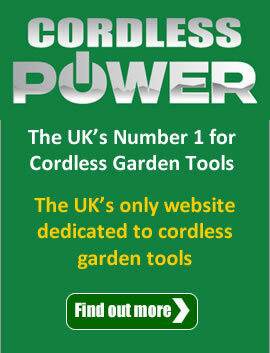 As always we are super busy here at Just Lawnmowers, but today I put “write blog” on the top of my (never ending) list! If you’ve experienced a pretty miserable and wet start to the year (join the club!) you might be feeling as cheerful as we are, now that we’ve had a bit of sunshine and dry weather, with a good forecast to encourage us to get on with some planning in the garden. I think it might be a bumper year for fruit and vegetables this year, judging by the wonderful blossom that has started to come out in my garden. Everything looks super healthy and this is most likely to be because of all the rain. (See it’s not just ducks that like a bit of rain, us gardeners do too!). Garden machinery is flying off the shelves here at Just Lawnmowers, and this year our garden tractors are more popular than ever before. This could be due to people doing their own gardens instead of getting help, perhaps we have the likes of Alan Titchmarsh and Garden SOS type shows to thank for that! Also garden tractors are more affordable and offer a more relaxed way to tackle the grass, whatever the size of your garden. Some are slim enough to fit through your garden gate meaning you don’t need a stately-home sized garden to benefit from the ownership of a garden tractor. Of course I can’t write a blog without mentioning some of our super duper garden machinery products that we stock here at Just Lawnmowers. And I thought why not start with garden tractors, they sometimes gets overlooked in reviews like this, due to their perceived size and price. I am a bit of a fan of the garden tractor as you might remember from previous blogs! With such a vast range that differs in price and features we are not surprised to find that it’s not just landscapers and people with huge gardens that buy them nowadays. Smaller and more compact, easy to operate models at good prices attract the attentions of our customers with modest sized gardens who appreciate the effort that these machines save. They give great finishes and can save a lot of effort for the user, leaving you more energy to do other things. I’ve picked out 3 really good garden tractors that are selling really well here at Just Lawnmowers. We always give great advice to our customers so if this blog has inspired you to purchase a garden tractor but you don’t know which one suits your needs, give our friendly knowledgeable team a ring today (01263 820202) and let us point you in the right direction. The first one up is the MTD 96 Plus “Special Edition” Transmatic Side-Discharge Lawn Tractor. I personally really like this one, it’s easy to operate, gives great results and has a very reliable engine. It works faster than a rear collecting lawn mower, so if that’s what you’re used to, then you will definitely see a difference, time wise. The MTD brand is well known and offers an innovative shift on the go transmission which basically gives you a very smooth change of gear as you go from neutral to top speed. This is especially helpful in smaller or confined areas. Overgrown areas are no problem for this lawn tractor. Five cutting heights between 30-95mm suit all conditions and give a great finish. Something to look out for if you’ve never owned a garden tractor before – the step through chassis. This allows for easy and safe mounting and dismounting. If your garden is something of a challenge with differing types of grass and conditions then you will appreciate the side discharge option especially if you have something the size of a paddock or rough ground to get through. The mulching option gives a very fine finish too. You may be surprised to discover that this engine is quiet, powerful and of course extremely reliable. We all lead busy lives – so you will be happy to know that this lawn tractor comes fully checked, assembled and ready to use. We also have a great offer with this tractor. With every MTD 96 Plus lawn tractor we will include a FREE MTD 33cc brushcutter (includes 2-stroke oil & mixing bottle), mulch kit & deluxe protective cover!! The second lawn tractor that is selling well for all the right reasons is the MTD 76 Plus Special Edition Transmatic Rear Collect Lawn Tractor. The best feature of this that sets it apart from the others mentioned here is the floating deck. This increases air flow giving a greater capacity for collecting the grass, making this lawn tractor very efficient. The semi-automatic transmission means you won’t be forever changing gears when changing speed giving you a much smoother ride. You can collect up to 200 litres of grass thanks to the large grass box, or you can choose to discharge them. If size is an issue in your garden it is worth noting the extremely tight turning radius of 46cm/18″, which is considerably smaller than most garden tractors of its size. There is an integral tow bar which means you can tow other equipment if needed which makes this garden tractor a very wise investment. We would recommend that this garden tractor is ideal for cutting areas between three quarters to one and a half acres of grass. We also have a great offer with this tractor. With every MTD 76 Plus lawn tractor we will include a FREE MTD 33cc brushcutter (includes 2-stroke oil & mixing bottle), mulch kit & deluxe protective cover!! 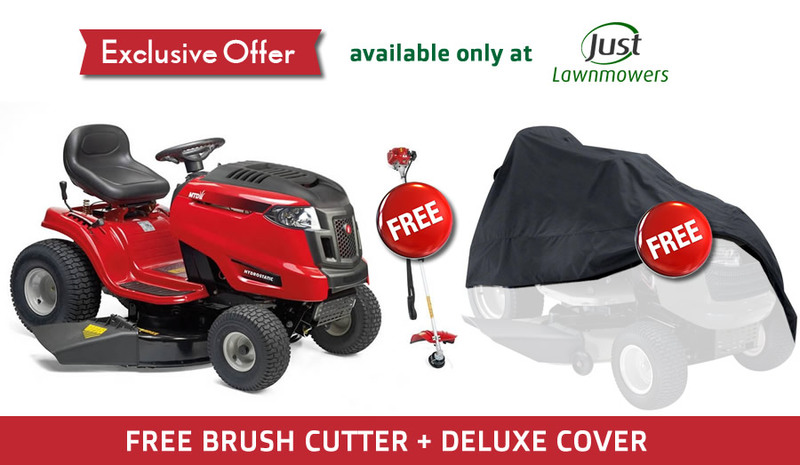 COMES WITH FREE 33CC BRUSHCUTTER AND DELUXE PROTECTIVE COVER!! Third up we have what some people might see as an obscure brand, but we think you might be surprised at some of it’s features; both innovative and practical. The Mitox MTX M38-S Side-Discharge Garden Tractor offers you all you would expect from a garden tractor, such as a comfy adjustable seat, side discharge and large free rolling wheels that offer comfort even over the bumpiest ground. Their large diameter will also minimise their impact on your nice neat lawn, giving you very reduced wheel marks and scuffs. It features a sturdy well built frame, built to last we believe. The Loncin engine is powerful and ultra-reliable and the integrated tow hitch means you can easily attach numerous towing accessories meaning this garden tractor works hard for you. A neat finish is easy and working hard and fast in rough ground or a paddock is something that comes very easily from this Mitox garden tractor. The twin-bladed 38” cutter deck cuts and quickly ejects the grass via the wide side-discharge chute for fast, easy ecological mowing. I hope this has given you something to think about, and as you may know we really do love our big brands here at Just Lawnmowers, but we also like to think outside the box! Sometimes something comes up that gives us food for thought – and these garden tractors have done just that, so take a closer look, just like we did, you will be pleasantly surprised! We hope we can help you in your quest for the perfect garden tractor, if our website doesn’t help please call us – we are always happy to talk about garden machinery – it’s our passion after all! Talk to us today on 01263 820202.